A while back, I made a stop-motion video with the Olympus PEN E-PL1. It was a video of the Monopoly Car driving around the game board. 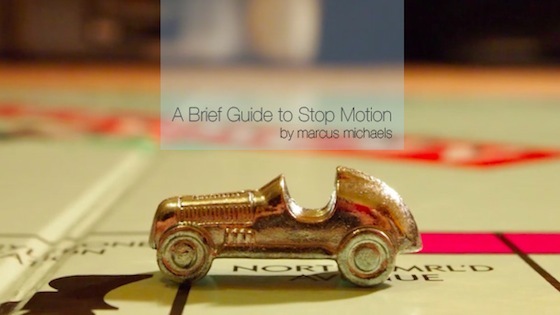 Olympus asked me to write a guide to making stop motion video. The video above was my second attempt at making a stop motion with my PEN. My inspiration came from Patrick Boivin, who, to me, is the master of epic stop motions. However, apart from his general skill and awesome film direction, he uses green screens, die-hard equipment set ups, expensive software and extensive post video processing (such as adding camera shake, focal blur, shadows and reflection etc. I didn’t have the time or budget to compete with this. In fact, I was bored and just wanted to have a bit of fun with my camera. It was about 2am when I decided to make the stop motion in my bedroom; I didn’t have many toys to feature but I came across my Monopoly set and started to play around. To get started, there are a few technical things to get out of the way. The main difference between an OK stop motion and a GREAT one is the FPS (Frames Per Second). You want to have at least 25-30 FPS i.e 25-30 photos for each second of your final video. This sounds like a lot of photos, and it is, but it’s worth it for a smooth video flow and not a jolty slideshow of consecutive photographs. Secondly, due to the amount of photos you’re going to take, you may want to reduce the size of your photos on your camera. For a 1080p video, it only has to be 1080 pixels high. I learned the hard way, uploading 292 photos at 5-6MB each. Not only does this leave you waiting around on the first upload from camera to computer, but then from computer to software and from software to video export. This is easily achievable on the E-PL1, make sure you’re using the [P]rogram, [M]anual, [S]hutter or [A]perture setting – anything other than iAuto: Press OK > Then scroll up/down to picture size/quality (It should have the letter L, M or S in a white square with F or N next to that) > Press Left or Right to something like MF (Medium Size / Fine Quality) and press OK.
Lastly, a quick word about lighting. I used only a small positionable lamp with the main light in the room on. This wasn’t ideal but it was all I had so if viable you should sort out the best possible lighting without having to rely on daylight. The Sun moves across the sky making objects cast differently positioned shadows throughout the day – this could make your finished stop motion look inconsistent. OKAY! Now we have that out of the way, here’s the fun part! Once you’ve set up your scene and your main character/moving object try setting the camera up to shoot some really cool, abstract and unconventional angles; this is a good time to play around with the Live View and some of the settings like the Aperture, Shutter Speed and ISO. Take a picture > slightly move the object(s) > take another picture > slightly move the object(s) again > repeat. REMEMBER: We’re taking 30 photos for 1 second of video footage; think where you want your object(s) to be in the video in 1 second and move object(s) accordingly. If you want to step it up a notch, like myself; set the camera to MF (Manual Focus), and start to blur the scene and then focus again by slowly turning the focal ring on the lens while taking pictures and moving the object(s). This adds a subtle effect of a video camera focusing on the subject. It looks more professional and adds added detail to your video that other stop motions lack. You could also move the camera with the object (like I did with the side view of the car) to make the background move making your object seem like it’s going really fast. You can even pan the camera around an object while it’s moving. Play about with different film techniques and apply it to your stop motion. Keep in mind that EVERYTHING is done with small movements, everything. Move the object(s) > move the camera > focus a tiny bit more > take a picture > repeat. At first it will seem tedious and slow. You will get the hang of it and you will get faster. I took 360 photos for 12 seconds of video footage in roughly 15 minutes and on one battery charge. Set yourself up a few scenes so it gives you a chance to change camera position – this will give add camera cuts keeping peoples attention and making the video look really nice. If you’re using a certain toy that may fall over, you can use plaster-scene or other moldable clay to keep it’s balance and hold difficult positions, but you will have to edit that out with photo-manipulation software afterwards, before you compile the images together. When you’ve got a substantial amount of quality photos, you’re going to want to put them together. Go ahead and upload them into an easily accessible folder on you computer, then once they’re up there, set up your image compiling software (iStopMotion) to match your FPS and drag and drop the photos into iStopMotion. You can use an array of software to do this for you, but I found the most lightweight and easiest to use was iStopMotion. You have to pay for it, but you can get a trial (shareware) version for free. If not, then use a search engine to track down any free (open-source) software laying about. Search for something like “Free Stop Motion Software” and any variations on that. Do that and then export them into a video format of your choice and voila! You have made a basic stop motion video. If you wish to add sound effects and/or music to your video (which I highly suggest you do as it adds impact and emotion), open up your favorite video-editing software, import the video and match music and sound effects to your video. There are plenty of “Free FX/Sounds” websites with, you guessed it, free downloadable sounds and effects, so search for them on a search engine as well. You may even find royalty free music to put in the background of your video for ambience. Before you export it from the video-editing software, now would be a good time to change the screen size, if you want to, to widescreen, or make it smaller in size and more suitable for YouTube or mobile devices. This would normally be found in the document set up, settings or preferences. There are so many other things you can tweak too to make your movie visually perfect in the video-editing software but I’m not even going to try and mention them all. But as long as your photography now moves, then I’m happy. Now go out there and experiment. It doesn’t matter if it’s bad the first few times. If you don’t fail, you won’t learn and the more you practice, the better you will be. It’s common sense! If this has inspired you to make a stop motion, please share it with me, I would love to see it and I’ll post a link to it on this very post!